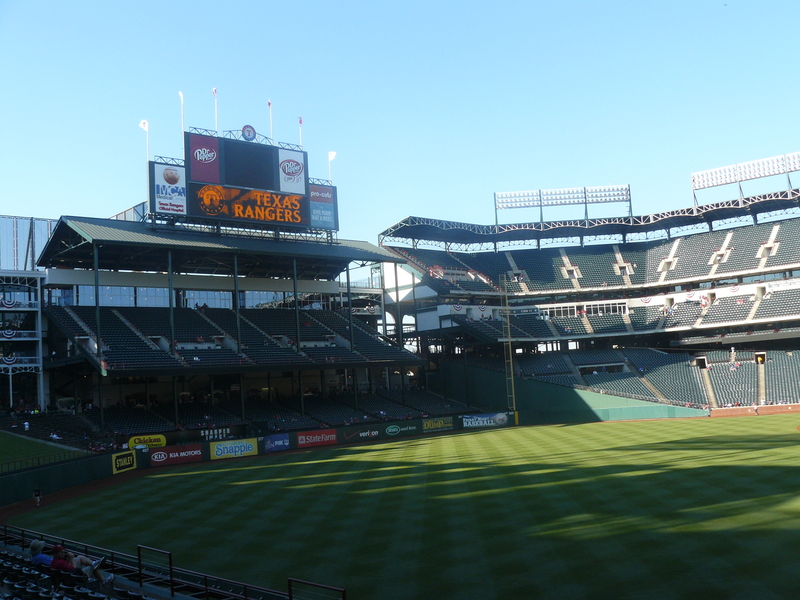 The Travels of a Rangers Fan | I have attended games at a total of 32 different MLB ballparks including all 30 active MLB ballparks. 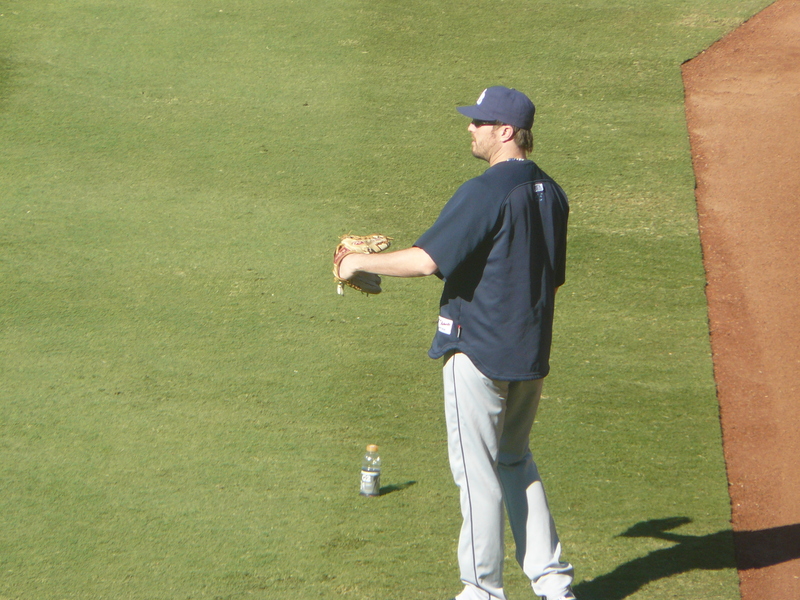 I don't consider myself a ballhawk per se but I do enjoy attending batting practice and trying to snag baseballs. My career total is 49 baseballs with 4 of those being game used. I have attended games at a total of 32 different MLB ballparks including all 30 active MLB ballparks. I don't consider myself a ballhawk per se but I do enjoy attending batting practice and trying to snag baseballs. My career total is 49 baseballs with 4 of those being game used. I had always wanted to attend an Opening Day game and still to this date have yet to do so. I had prior obligations on Opening Weekend 2011 having to work for the Bossier-Shreveport Mudbugs as an intern that weekend. It was the Opening Round for the CHL Playoffs for us that weekend but I was able to get off work that weekend and schedule a trip up to Arlington for a Sunday afternoon game against the visiting Boston Red Sox. 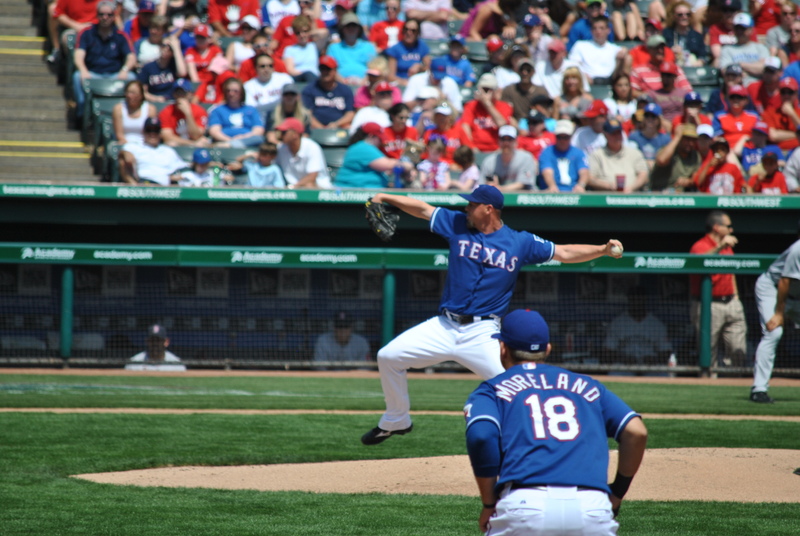 Our pitching match up for the day would be Clay Buchholz going up against Matt Harrison for Texas. The recurring theme for the day though would be power as the Rangers would end up hitting four homers in the game with each one being a solo shot. The Red Sox meanwhile couldn’t get much going on the day as they would score only one run with five hits – two coming from “Big Papi” David Ortiz. 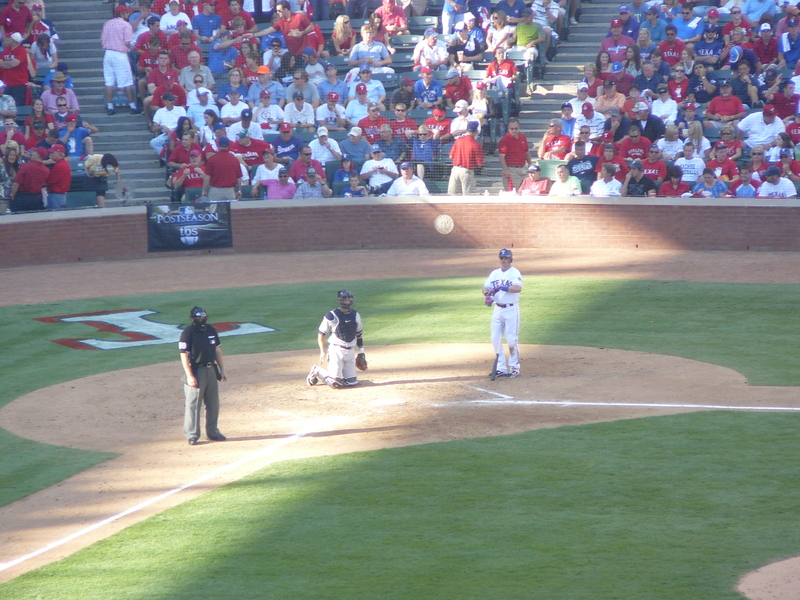 David Murphy of the Rangers got things started in the second inning with the first of the four homers to come on the evening to give Texas the 1-0 lead. Ian Kinsler would go deep in the third inning which would be his third homer of the season already (he homered in each of the first three games of Opening Weekend). 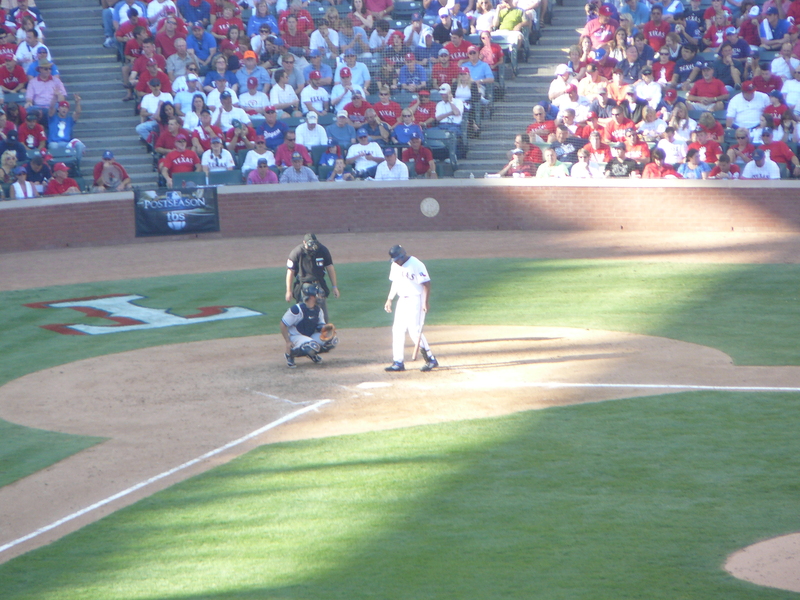 Mike Napoli followed up with his own solo homer in the fifth inning before Nelson Cruz would hit a homer in the eighth joining Kinsler as the other Ranger to hit a home run in each game of the Opening Series. 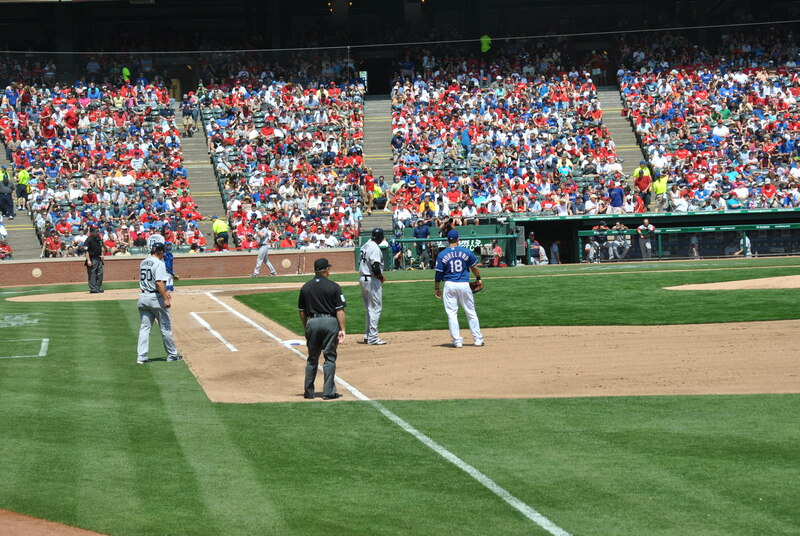 Michael Young added an RBI double in the eighth inning to make it 5-1 Texas. Matt Harrison would pitch a great game for the Rangers as he went seven innings striking out eight Red Sox and allowing only one run plus five hits. Harrison would allow the Rangers to be able to sweep Boston in the Opening Series and ruin their first series with their newly acquired players from the 2010 off-season (Adrian Gonzalez & Carl Crawford). With not else much to mention I’ll add some bonus photos for you guys. Enjoy! 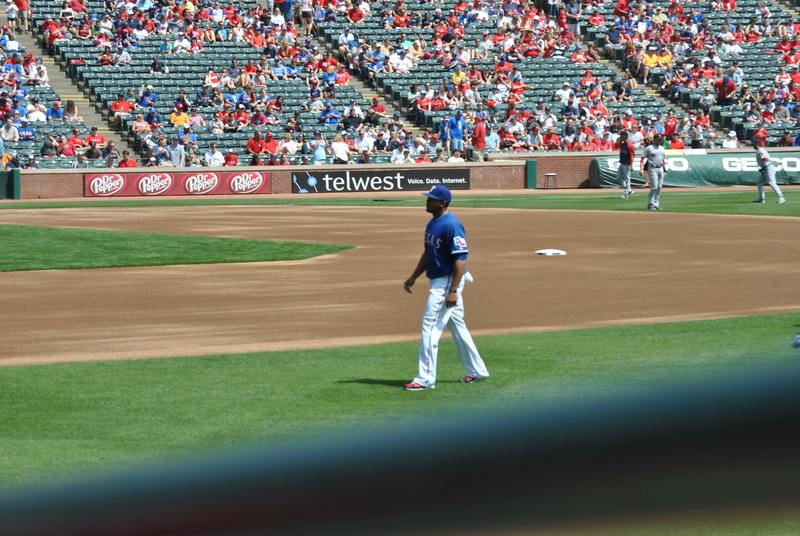 Nelson Cruz taking a moment to look down the first base line before he would go deep later in the at bat. 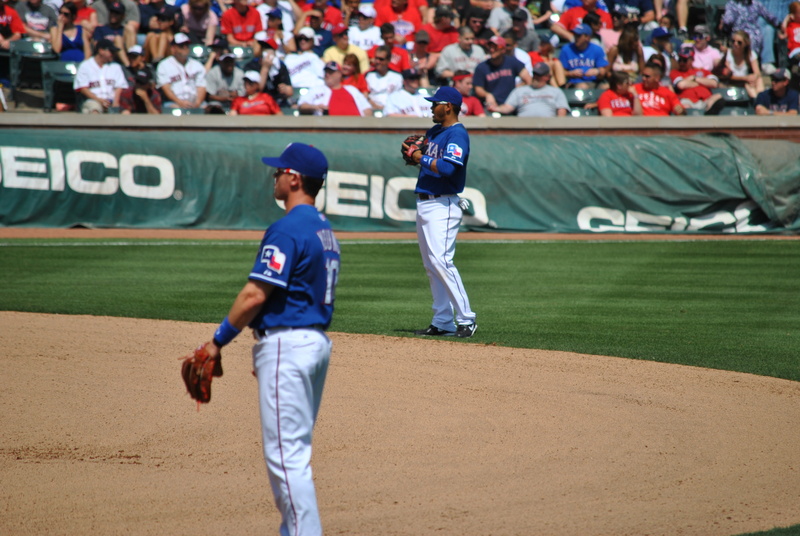 Newly apointed super utility infielder Michael Young at second base and Andres Blanco at short stop. 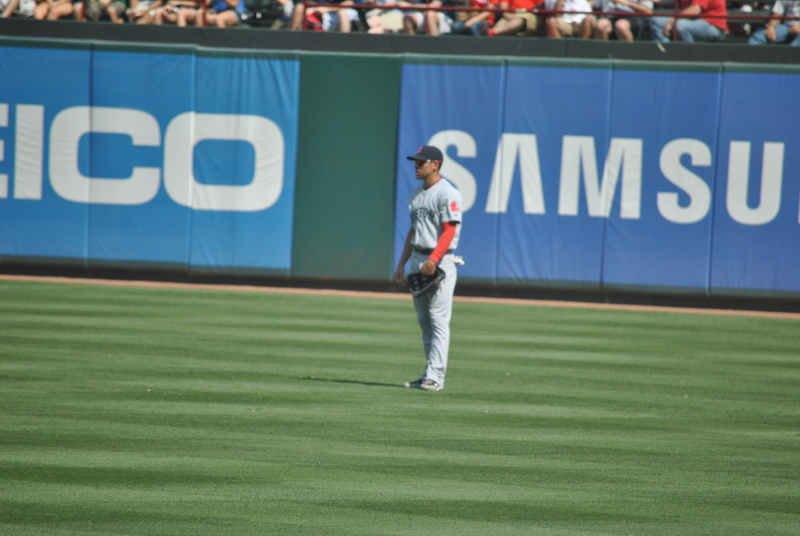 Jacoby Ellsbury patiently waiting in the outfield. And finally your final score. I’ll be going back to Oakland and San Francisco after having been there in 2012. However, it will be my first time to LA and San Diego in nearly nine years. I was only 13 when I went the first time which seems like forever ago. So needless to say I don’t really remember as much of the ballparks as I do several others because they were some of the first ballparks I went to. I’m greatly looking forward to going back to LA and seeing how much I remember and how things have changed. After the previous night’s World Series victory I was very anxious for Game 4 later that evening but first off we had some other business to attend to. I was taking a look on Stubhub the night before and noticed that the Cowboys would be having a home game against the Jaguars at noon with the World Series game set to start at 5:05. 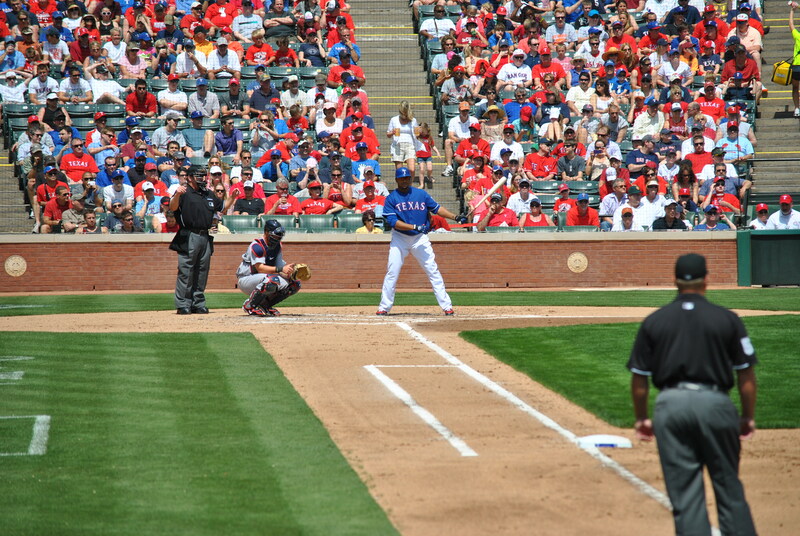 This meant that there was a great opportunity for a Doubleheader – the Cowboys and the Rangers all in one day! I don’t have the photos from the Jaguars vs. Cowboys game on my current computer and they are on a memory card somewhere but I will spare the pictures and just let you know the Jaguars won. It was my first ever NFL game and I paid only $15 to sit in the nose bleed seats (which if anyone knows at Cowboys Stadium is not necessarily a bad thing). 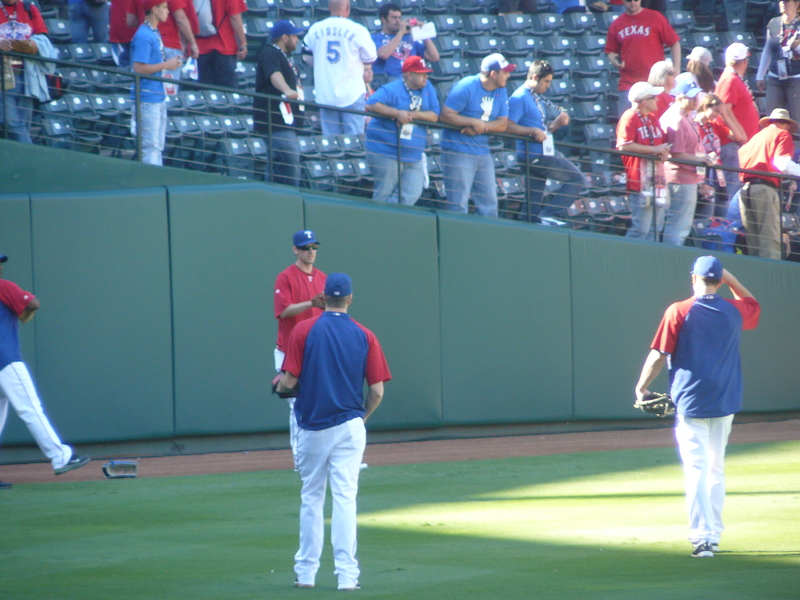 We ended up making the short mile walk back to Rangers Ballpark after the game in preparation for batting practice. Nothing really came close to me as far as I remember. Excitement was still in the air as not only was it Game 4 of the World Series in Arlington but it was also Halloween! This meant many fans were dressed up in costume (here and at the Cowboys game as well) and it was certainly a different type of atmosphere. Take a look at who was taking in the scenes before the game started. Shortly afterwards it was time to do the National Anthem and throw out the first pitch. 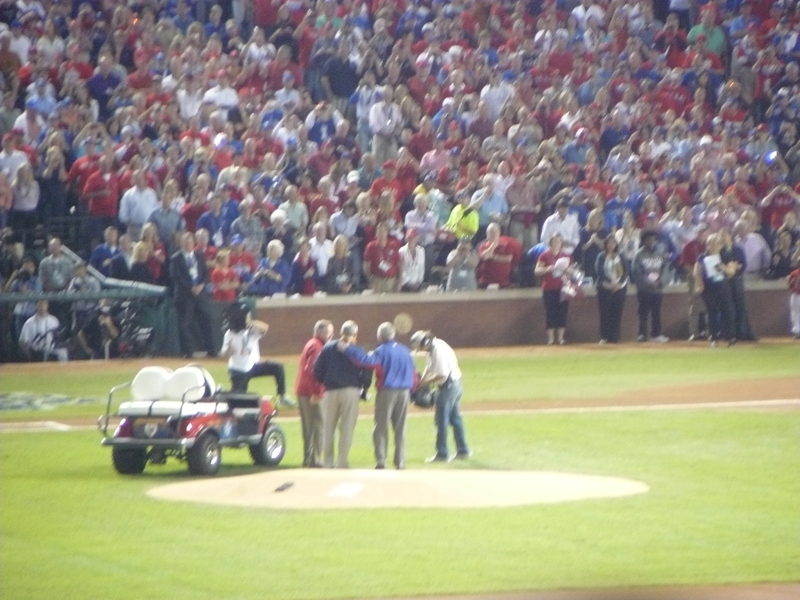 Our ceremonial guests throwing out the first pitch was none other than the 41st POTUS – George Bush and the 43rd POTUS – George W. Bush who were accompanied by then Rangers President Nolan Ryan. And it was game time! 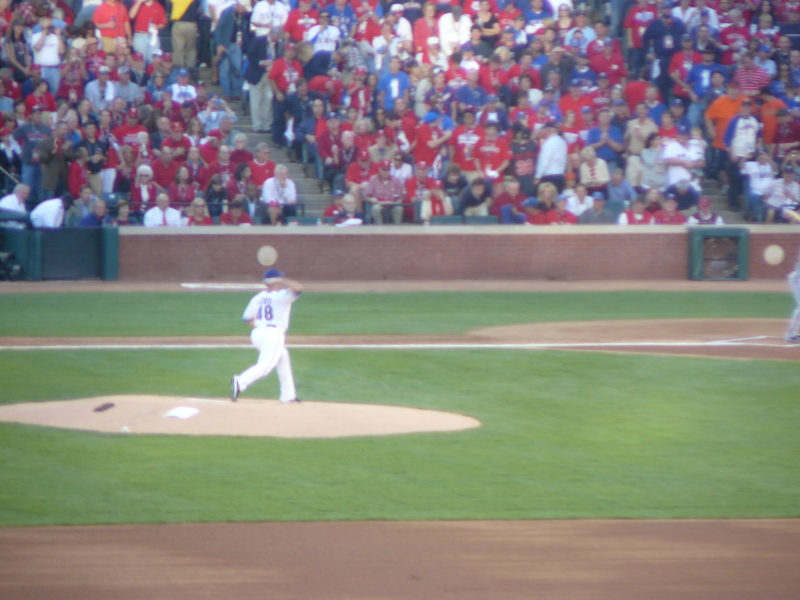 Here’s a shot of Tommy Hunter delivering the first pitch of Game 4 to Andres Torres. 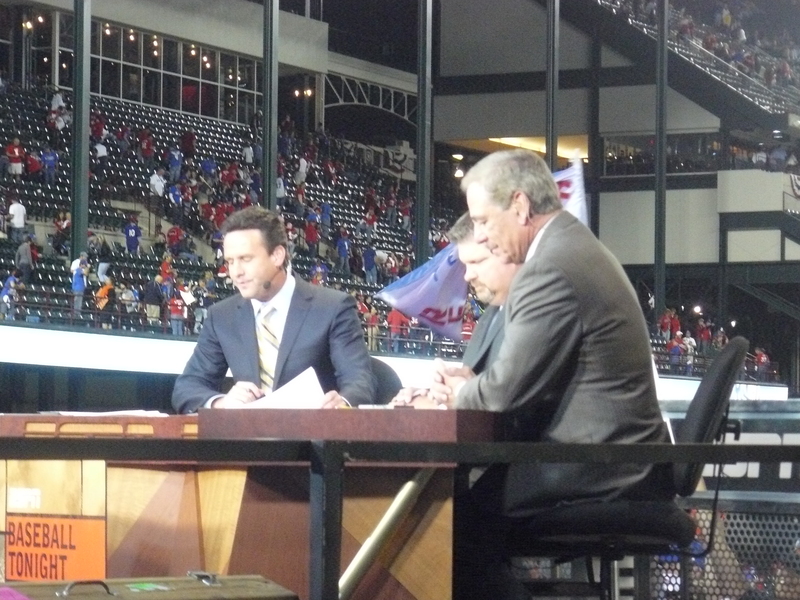 Game Four wouldn’t be nearly as exciting for the Rangers fans thanks mainly in part to Madison Bumgarner. 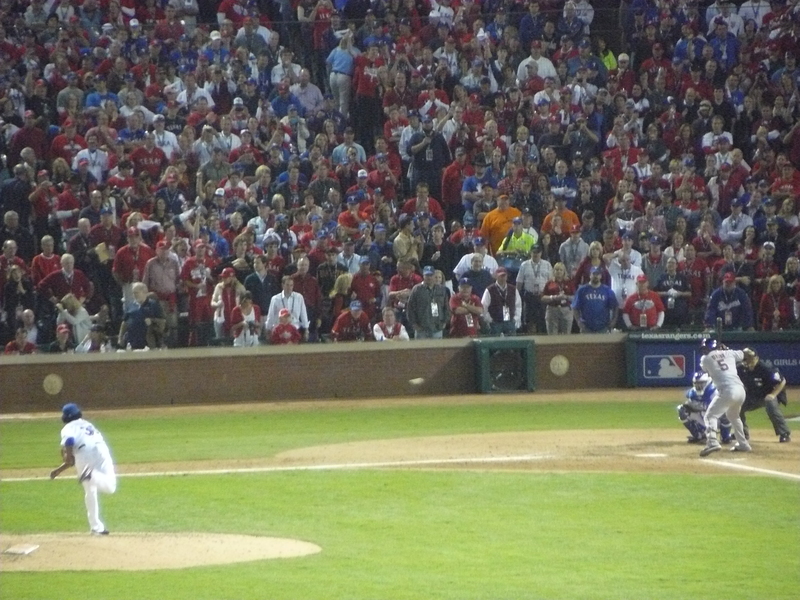 The rookie spun a gem in his World Series debut going eight innings and giving up only three hits. 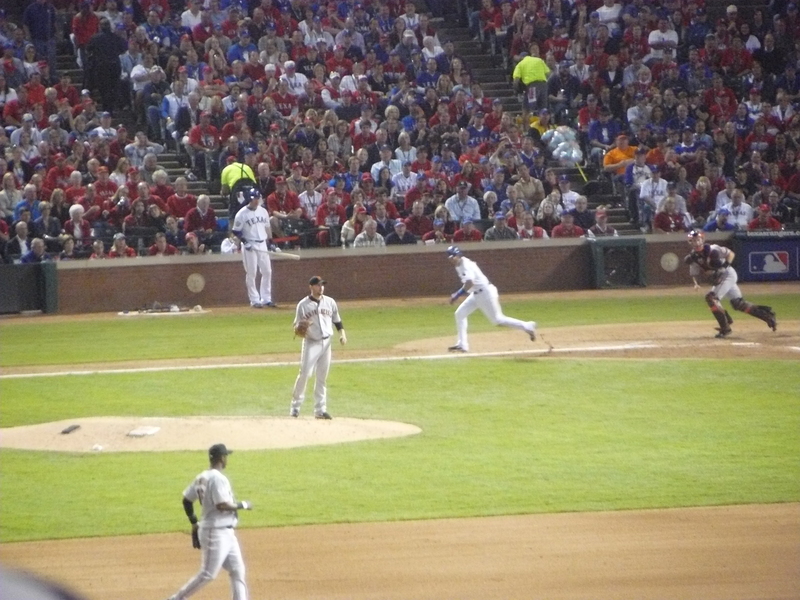 Bumgarner managed to strike out six Rangers while walking only two. San Francisco’s offense mainly came from Aubrey Huff’s two run homer in the third and rookie Buster Posey’s solo shot to deep center in the eighth inning. 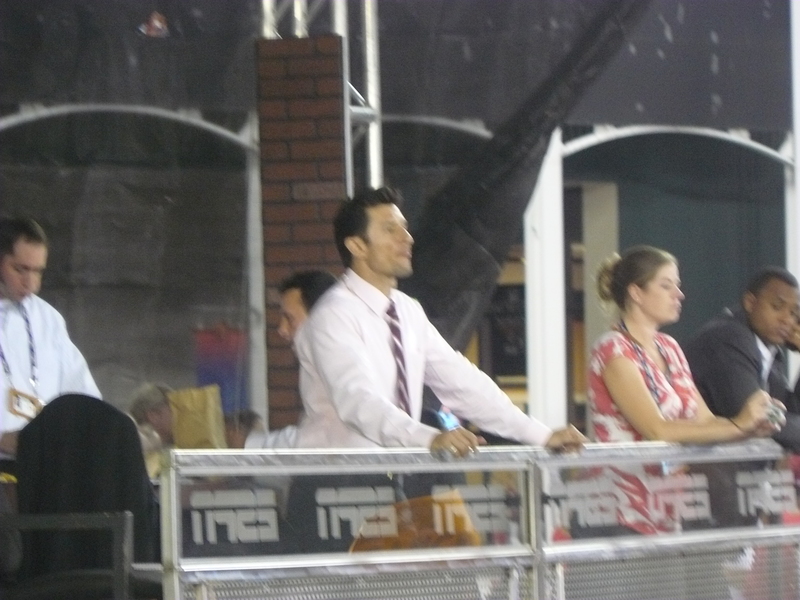 Andres Torres also had two doubles in the game and the eventual World Series MVP Edgar Renteria added three hits. 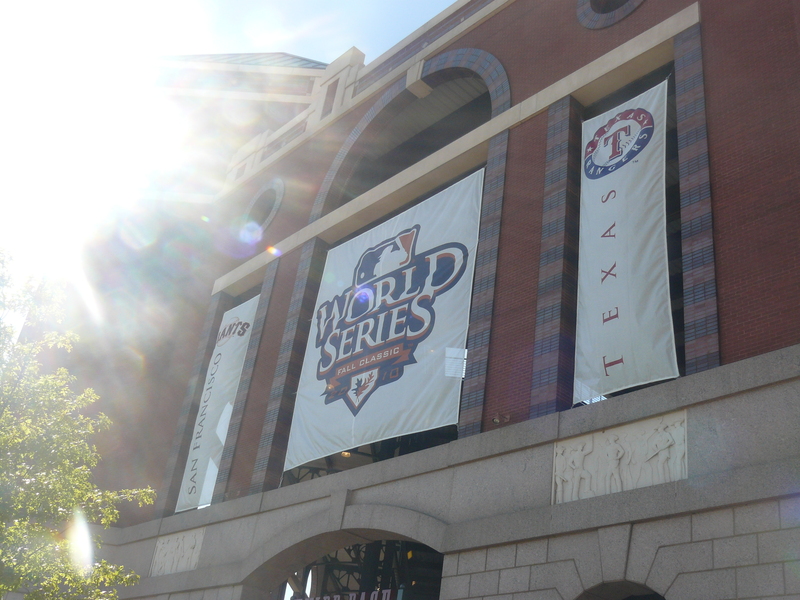 Unfortunately, the next day would be the end of the World Series for the Rangers and I would not be able to attend Game 5 regardless because of school. It was certainly an amazing experience that I will never forget and despite not having actual seats for either game I thoroughly enjoyed my time at the 2010 World Series. One of my biggest dreams was coming true on this day as I’d be attending my first ever World Series game. It was something I had always wanted to do growing up. After watching series such as the Arizona vs. New York and the Florida vs. New York World Series I always wanted to revel in and watch my own team compete for the most prestigious prize in Major League Baseball. 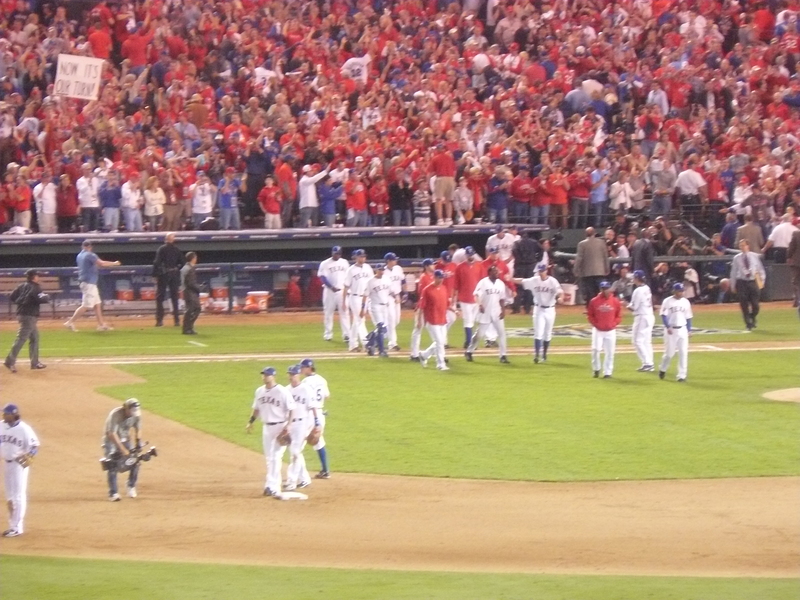 So many emotions were running through me that day as I could not wait to get to Rangers Ballpark in Arlington. I wanted to buy souvenirs, try and get a ball from batting practice, walk around the stadium and enjoy the sights and sounds, and much much more! When I bought tickets to go to Game 3 & 4 the only tickets that were available directly through the team was Standing Room Only. I had never attended any type of event with SRO tickets but I wasn’t going to pass up the opportunity to attend the World Series for only $50 a ticket! Sure I’d like to have had a seat but this was a once in a lifetime experience! 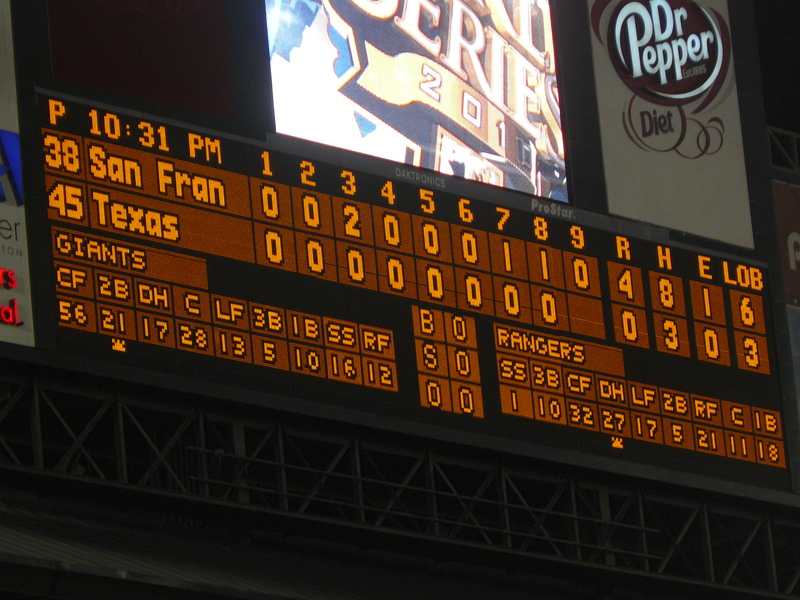 I was having such a good time that I was ready for the game to start and hope the Rangers could earn their first ever World Series win after having been down 2-0 after leaving San Francisco. 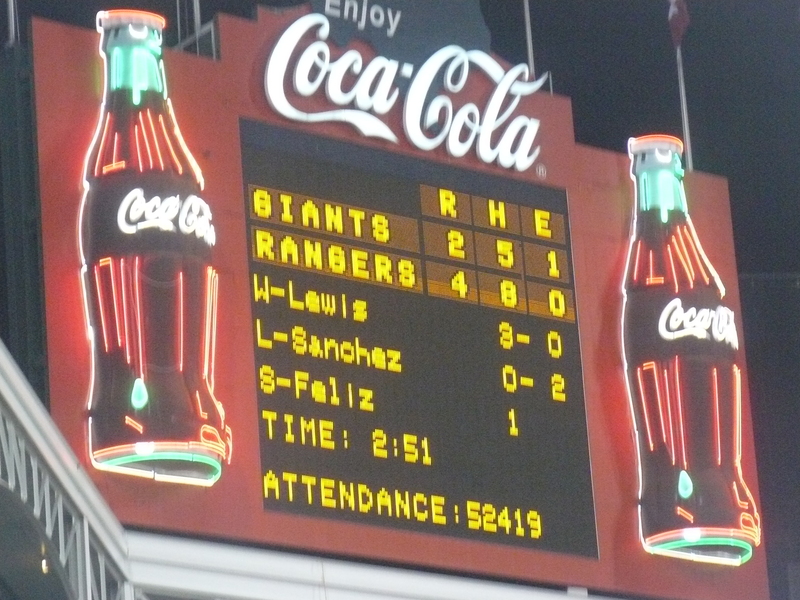 A shot of the scoreboard in one of it’s last games in it’s current technology. It would be updated in the off season to become a big HD scoreboard. Mitch Moreland put the Rangers on the board in the second inning absolutely crushing a homer to right field off of San Francisco starter to give the Rangers the 3-0 lead in what would be more than enough for victory on that night. 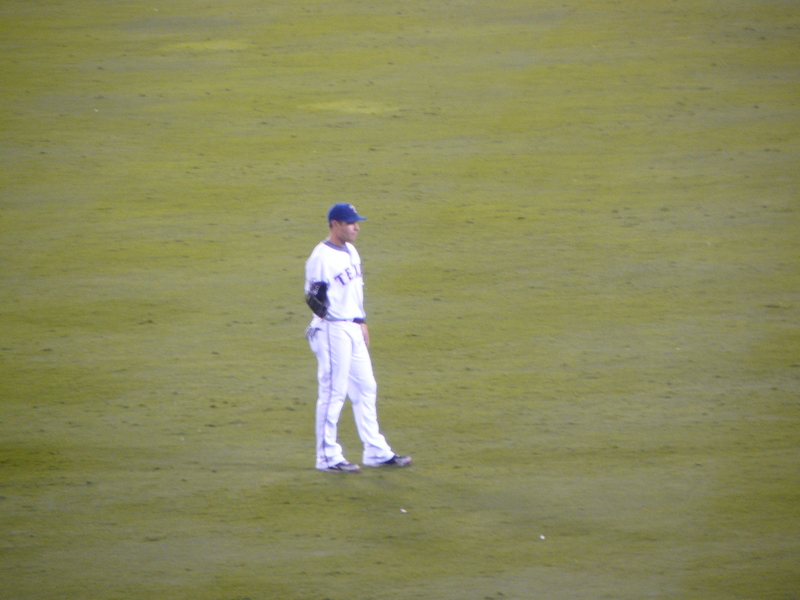 Here is a good shot of the man who also went yard later on in the game – 2010 American League MVP Josh Hamilton. Colby Lewis pitched a good game for Texas going 7 2/3 innings giving up only two runs on six hits while striking out six. 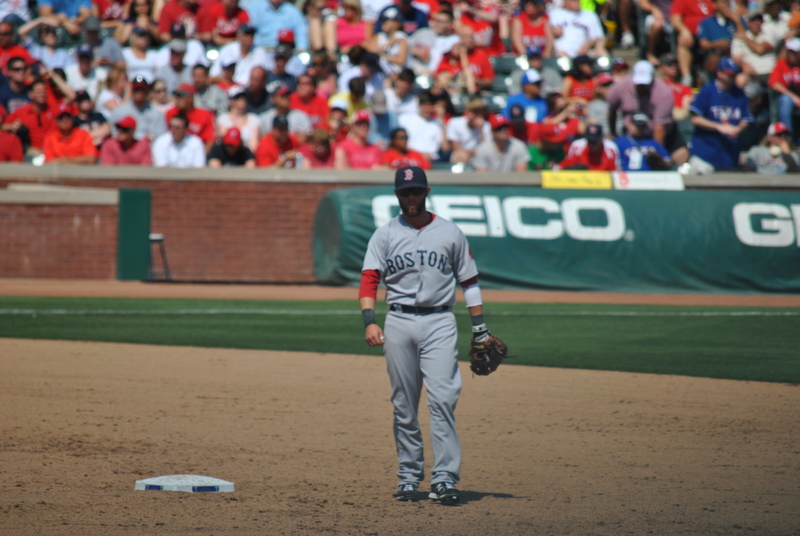 Both runs came from solo homers allowed to Cody Ross and Andres Torres in back to back innings (7th & 8th). 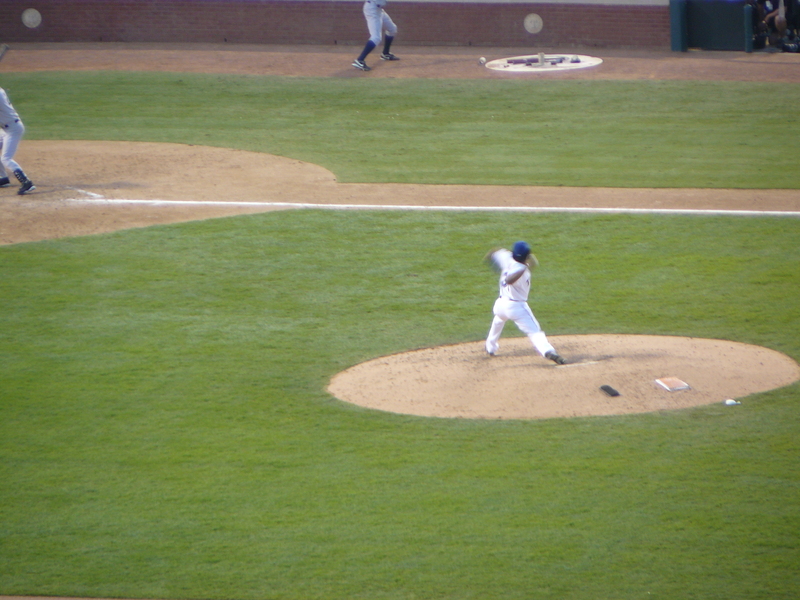 My camera didn’t really cooperate too well with many photos but I’ll try and add in a few more from the game. 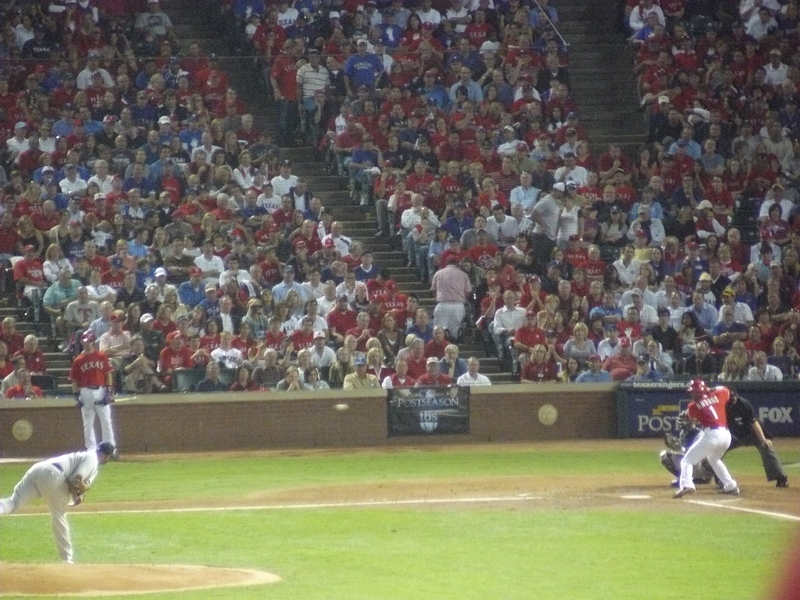 The 2010 American League Rookie of the Year came on in the ninth inning trying to earn the save and give the Rangers the first ever World Series win in team history. 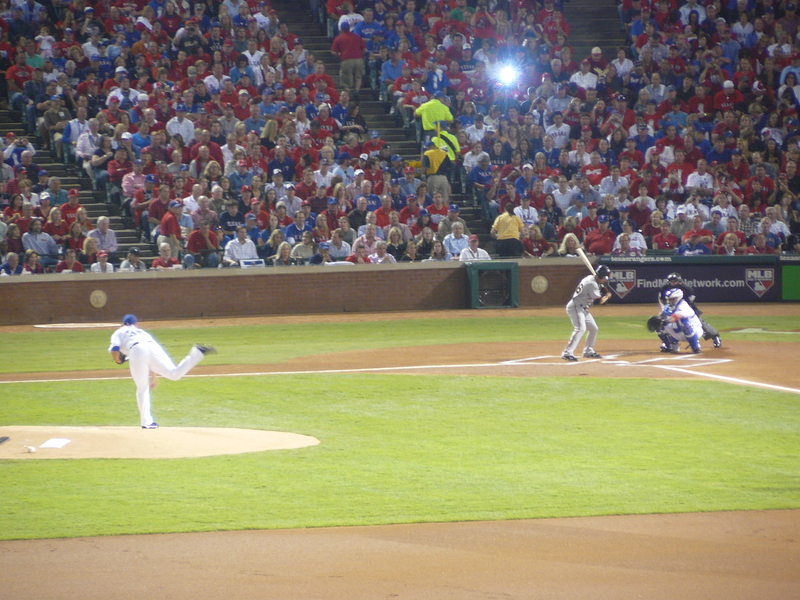 Feliz would end up striking out Pat Burrell, getting Cody Ross to fly out, and as shown here striking out Juan Uribe. The team would be able to celebrate shortly after Feliz got Uribe to sit down and suddenly the series had a change of momentum. No longer down 2 games to none the Rangers were going to be able to test their luck the next night in Game 4. A good view of the final score thanks to the scoreboard in center. And finally before leaving the ballpark we stopped in center field to watch the ESPN Baseball Tonight crew go live on air near the bleachers. I was pumped up for batting practice to get underway and the big hero of the day to me would end up being Vladimir Guerrero who quickly hit a ball towards right center and I easily camped underneath it for my second ball of the ALCS and my lifetime 17th baseball. I was thrilled to be on the board once again and more importantly get a baseball this time from a Ranger! The Rangers hopped onto another 5-0 lead after three innings after an exciting double steal in the first inning from Elvis Andrus who stole home and Josh Hamilton who stole second. 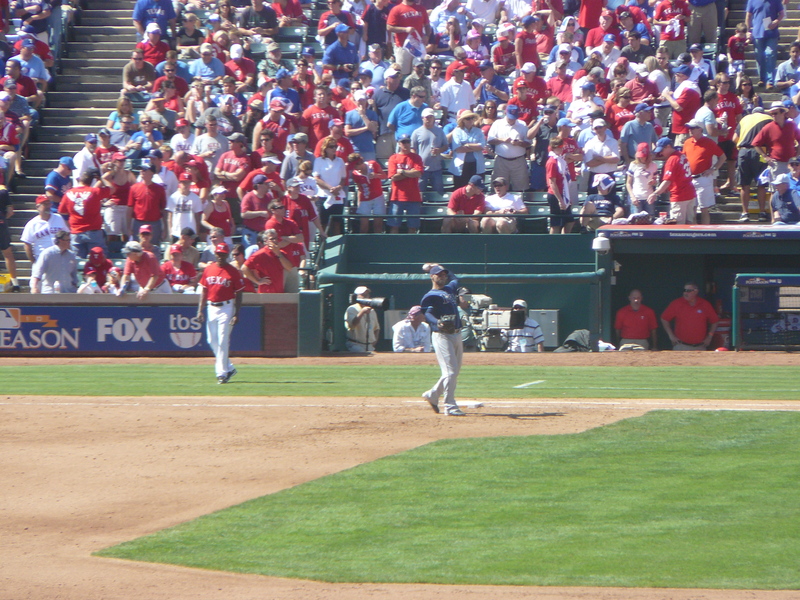 Two runs in the second inning were produced by a David Murphy solo home run and a Michael Young RBI double. The third inning saw the Rangers get two more runs off Yankees starter Phil Hughes on back to back RBI doubles from David Murphy and Bengie Molina pushing it to 5-0. The Yankees added a run in the fourth inning on a Lance Berkman RBI single scoring Nick Swisher and cutting it to 5-1 off of Texas starter Colby Lewis. The Rangers chased Phil Hughes in the fifth inning with a Nelson Cruz double and Ian Kinsler’s triple which brought Cruz in to make it 6-1 Texas. Mitch Moreland would end up getting a single off of new relief pitcher Joba Chamberlain extending the lead to 7-1. The only other run the Yankees would get on the evening would be on a Robinson Cano homer in the sixth inning. In the ninth inning it was time for 2010 American League Rookie of the Year Neftali Feliz to come on albeit in a non save situation. Back in the fall of 2010 I was starting my freshman year of college at Northwestern State University which is about four hours southeast of Arlington. I was not working at the time as I took my first semester off in hopes of starting off at college and getting the “true experience” minus the job part. Anyways long story short I had a lot of free time and this meant that with no job that I could make as many trips to go places as I want. 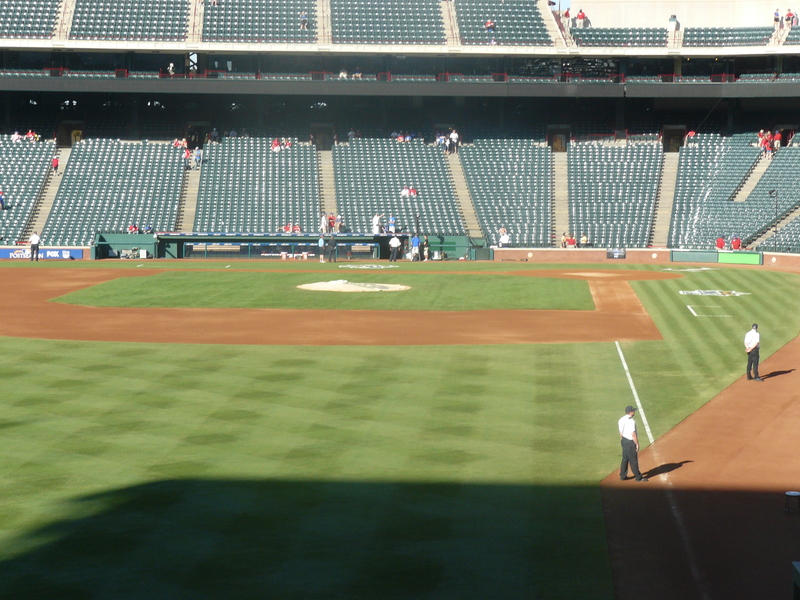 My parents and I were just in Arlington for the ALDS and I really had no plans to go to the ALCS unless I could get tickets for a reasonable price. 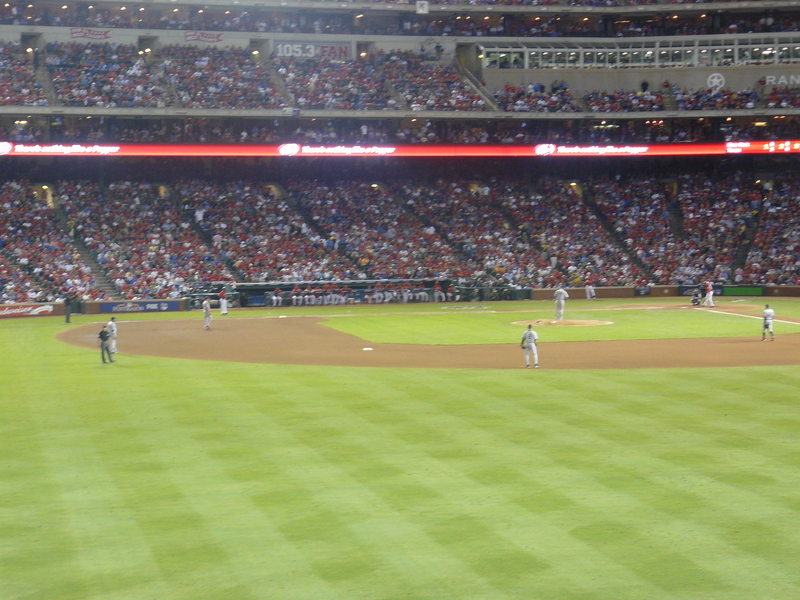 I got lucky as I ended up winning the ALCS lottery that the Rangers were running and I got a solid set of tickets out in left field in the reserved seats for the first game on Saturday night against the New York Yankees. Playoff excitement was in the air! 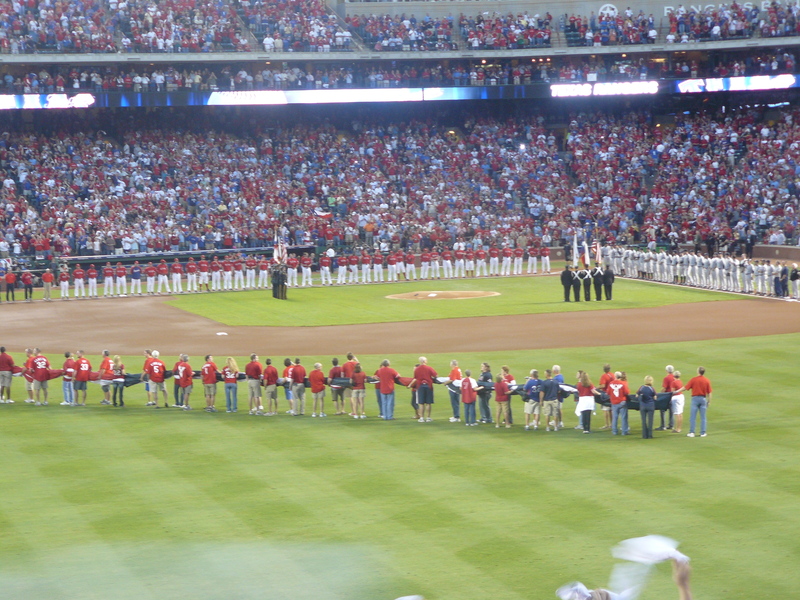 The Rangers were set to play for the first time ever in the Championship Series and boy was I pumped up to be there! 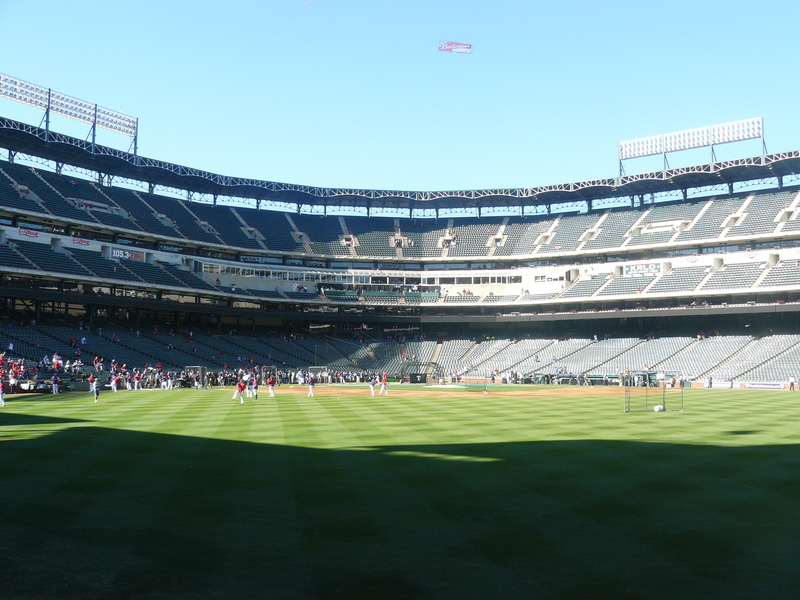 Once the gates opened I took off towards the right center portion of the bleachers and not too long after I arrived the Rangers were still taking BP. I didn’t get lucky during the Rangers portion of BP but I did end up catching an Alex Rodriguez homer on the fly during batting practice! It was my first ever postseason ball and while it was no commemorative it was certainly exciting to be on the board. It was my sixteenth ball lifetime and tenth of the season for me. Without a doubt 2010 was a great year for me ballhawking wise by my standards at least. Here was the scene when the National Anthem was being sung right after both teams had been introduced. 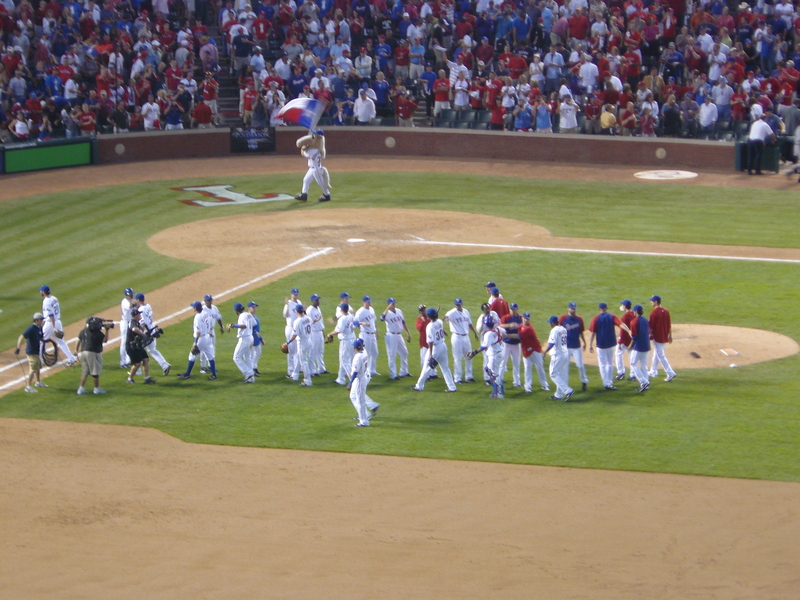 The game got underway shortly afterwards and the Rangers took the lead for the first time ever in team history in the ALCS on a Josh Hamilton three run homer that scored Elvis Andrus and Michael Young. 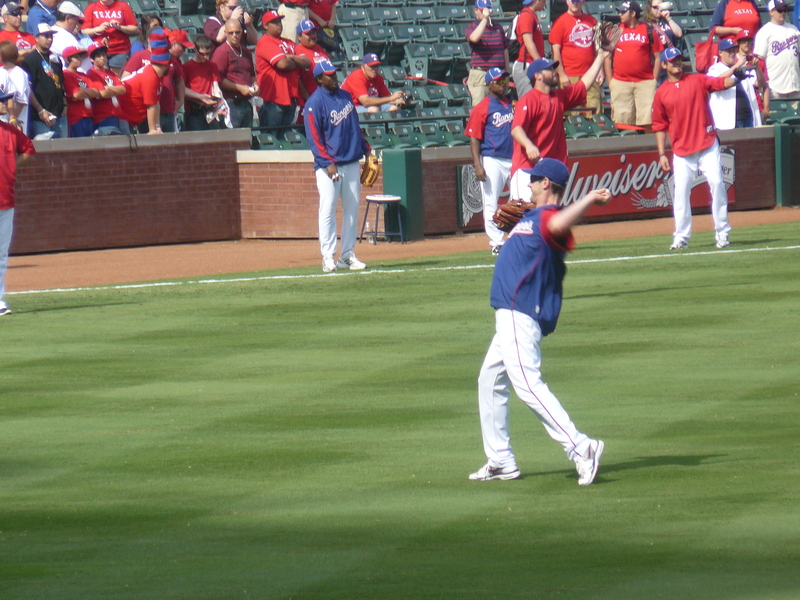 Here was Hamilton later on in the game warming up with David Murphy in left. Rangers starting pitcher C.J. Wilson was doing a good job containing the Yankees offense as he carried the 3-0 lead into the fourth inning and was given more insurance after a Michael Young double that brought in Matt Treanor and Elvis Andrus and made it 5-0. 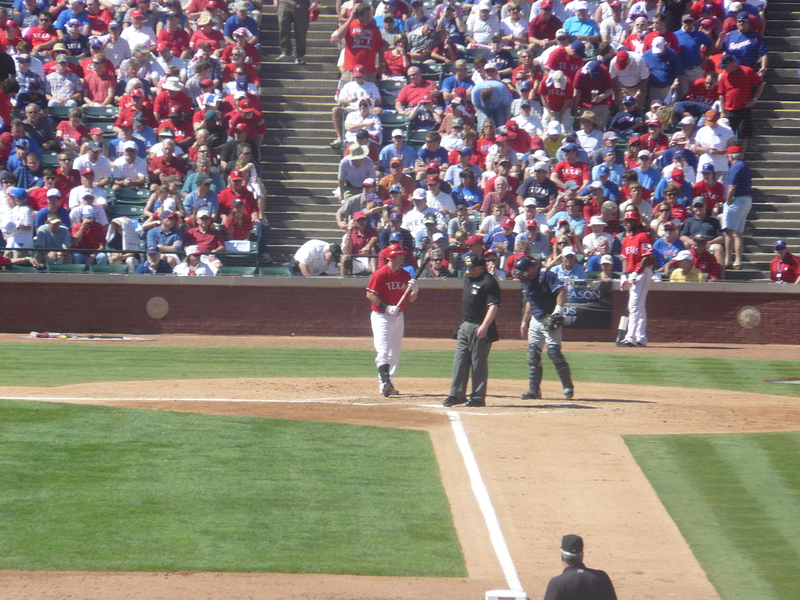 Below was Andrus at bat prior to Young’s double. Wilson didn’t give up a run until the seventh inning on a lead off Robinson Cano homer to make it 5-1. 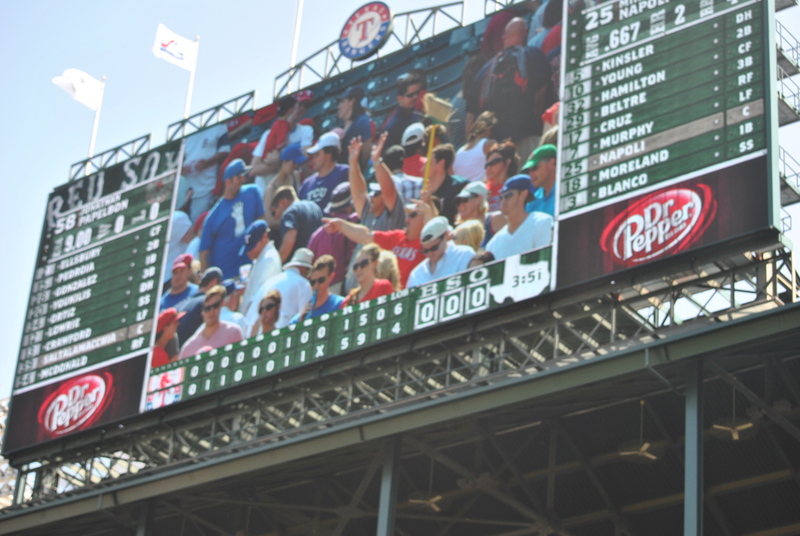 The eighth inning would be where it would fall all apart for the Rangers. Wilson gave up a single to Brett Gardner and a double to Derek Jeter that brought Gardner around to make it 5-2 Texas. Wilson was replaced by Darren Oliver who issued two consecutive walks and was replaced by Darren O’Day with the bases loaded now. O’Day gave up a single to Alex Rodriguez that brought two Yankees in and made it 5-4. O’Day was promptly replaced by Clay Rapada who gave up the game tying hit to Robinson Cano on a single. Rapada was pulled then in favor of Derek Holland. Holland did give up the game winning single on a Marcus Thames RBI single but he finally settled down and got the next three men out to mercifully end the inning where five different Rangers pitched. 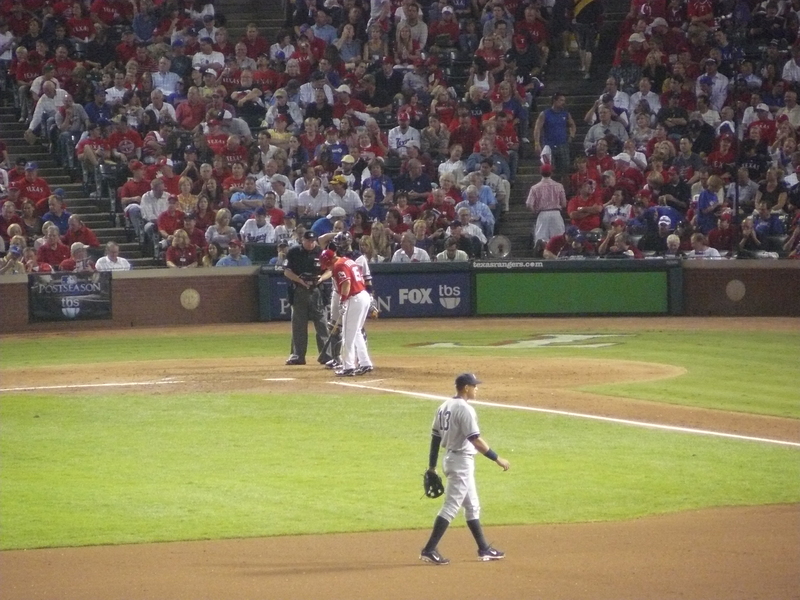 Ian Kinsler led off with a walk but was picked off promptly by Kerry Wood and pretty much brought any chance of coming back in the eighth to a screeching halt. The ninth inning was no better as Mitch Moreland did get a pinch hit single and advanced up to second on Elvis Andrus’ sacrifice bunt but Michael Young would strike out and Josh Hamilton would ground out to end the game. Despite the disappointing end I was prepared to be back at it early the next afternoon as Game 2 would be taking place in the mid-evening and I was hoping that Game 2 would end a bit better than Game 1 did. It was nice to get my first ever baseball from a postseason game but it was disappointing to not get to see Texas take a 1-0 lead in the ALCS. 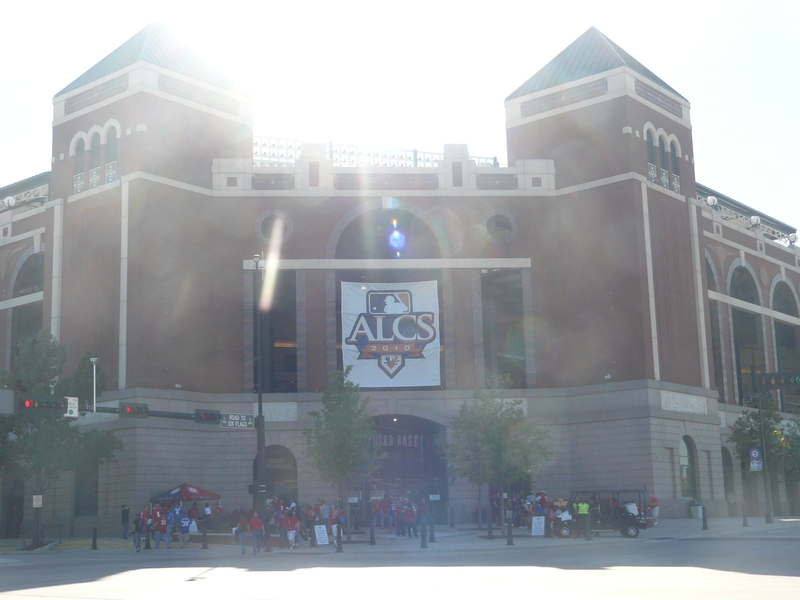 After a disappointing afternoon on Saturday for Game Three of the 2010 American League Division Series my father and I were prepared to head out to Rangers Ballpark in Arlington on Sunday in preparation of hopefully seeing the Rangers pull out a victory and to send the Rangers into their first ever ALCS. I believe game time was set for about 1:10 or so but the gates opened around 10:30 AM that morning. It was certainly the earliest I ever remembered being at a ballpark and I was hoping for some batting practice on this beautiful Sunday afternoon. But unfortunately this was the scene as we arrived in our seats in left field. With no batting pratice occuring it was going to make for a long day waiting for the game to start. 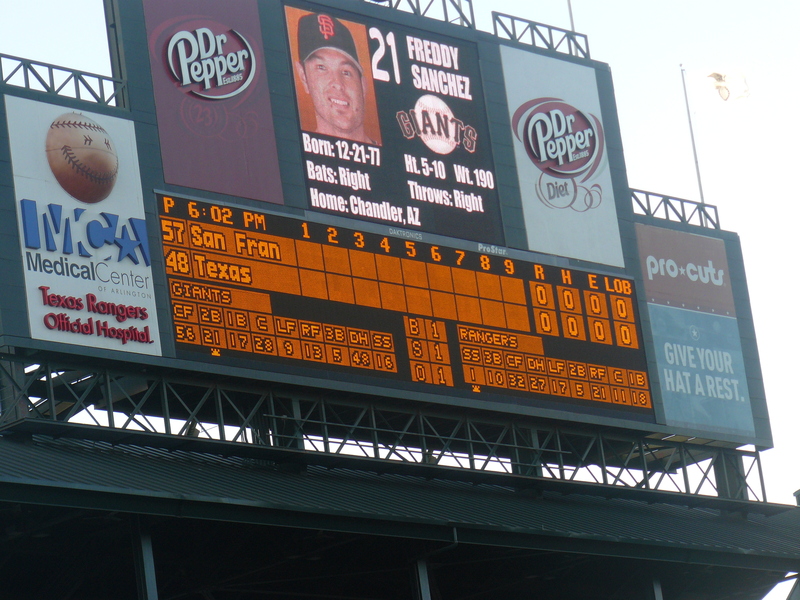 The good thing was that it was October and that it wasn’t quite 100 degrees as is common in Texas but I still remember it being a warm day once the game started despite the wind blowing heavily throughout the ballpark during the game. To kill some time I took some pictures to show just how empty the park was and how amazing it would have been to have batting practice taking place. For some reason I’m not sure why but I don’t have many pictures from this game. I really am not sure why as I always enjoy taking many photos at the ballpark but as I go through the folders on my laptop I don’t see many at all. Anyways, the game kicked off with Tampa Bay sending Wade Davis to the mound against Texas who countered with Tommy Hunter. Tampa Bay took the lead early in Game Four on a Carlos Pena triple followed by Matt Joyce reaching on an error to make it 1-0. Then in the fourth inning Evan Longoria doubled followed by a Pena RBI double as it became 2-0. B.J. Upton then hit a two out double and made it 3-0 and it was beginning to look a bit bleak in Texas. Tommy Hunter only lasted four innings after giving up three runs on six hits but perhaps most impressive was that through that he had managed to strikeout seven Rays. Derek Holland was called into the game and he ended up pitching four innings himself with not too much luck either. In his first inning Holland gave up a Ben Zobrist single, Bengie Molina allowed a passed ball allowing Zobrist to take second, and then Longoria went deep as he continued to be a pain in Texas side as the Rays now lead 5-0. The Rangers finally scored in the sixth inning on a lead off home run by Nelson Cruz. 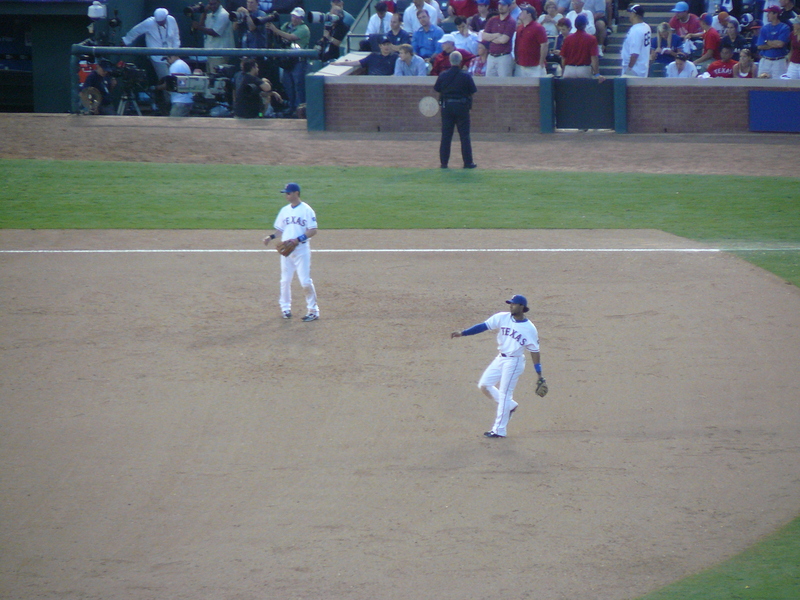 Ian Kinsler followed suit with a single and eventually Mitch Moreland (pictured above) would hit an RBI double to score Kinsler as the game was now 5-2 Tampa Bay. Unfortunately that would be all the scoring on the evening and it made for a somewhat disappointing trip for my first time to attend a playoff game in any sports. Two games and two Rangers losses did not really add up for a “exciting” weekend but getting the chance to attend playoff baseball was more than enough for me! Game Five was set to take place two days later in St. Petersburg and little did I know that just six days later I’d find myself back at Rangers Ballpark in Arlington for the first ever Rangers game in an ALCS.